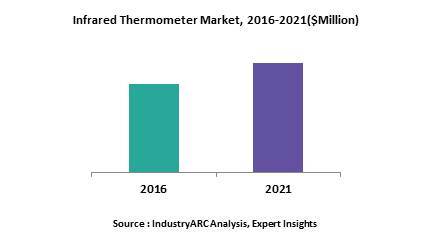 An infrared thermometer is used for temperature measurement without any physical contact. An infrared thermometer is accurate and easy to use. It does not require much work for correct calibration. Temperature measurement is one of a major tool to find out patient body’s temperature for any disease detection. Normal body temperature is 98.6°F (37°C) and fever is a measured body temperature above normal. Causes of fever can be various as infection, other medical conditions, severe trauma or injury, and some medicines. Usually, temperature is measured using contact thermometers on multiple places on the body. Devices such as Infrared thermometers measure temperature on the forehead without any physical contact as these are held between 1.2 and 6 inches from the body. Temperature over other body surfaces may also be measured depending on the specifications. The risk of cross-infection is low and probe covers do not need to be disinfected or thrown away owing to contactless operation. The operational advantage of infrared thermometer is the accuracy, low cost, smaller size, easy training and usage, and less need for calibration.